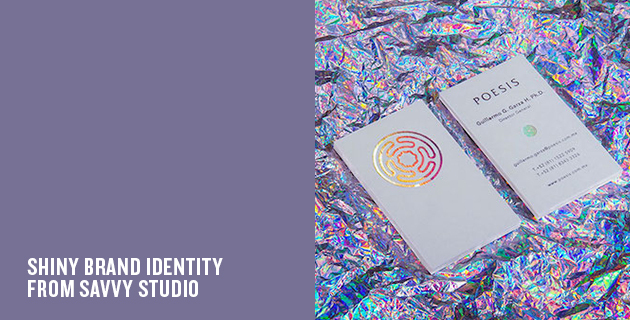 This beautifully shiny branding and website work is by Savvy Studio and was created for Mexican consulting company Poesis. The logo was developed taking inspiration from the Greek Strophalos or Hecate wheel, which represents life, knowledge and fulfilment, while the labyrinthine outer circles represent the process of reaching intellectual goals – Poesis’ professional aim. This mythical and very complex background lends itself perfectly to an otherworldly corporate identity, using shiny foil finishes and mystical imagery. Shiny foil could’ve felt tacky, but the branding is otherwise simple and slick, making it just a little bit psychedelic and allowing it to stand out just the right amount.